Aurelia Louise Jones was born in Montreal in a French Canadian family in the early 40’s. She graduated as a nurse in the early part of her working career, and also worked as a Spiritual and Health Counselor most of her adult life, as a naturopath and a homeopath, using several holistic modalities. She also included in her practice holistic animal care and consulting, using nutrition, homeopathy, flower essences and several other natural healing modalities. She moved to the U.S. in 1989. Under the sponsorship of the Brotherhood of Light and the order of Melchizedek, she was ordained as a minister in 1998, and devoted much time to her spiritual ministry. She also taught the principles of higher consciousness leading to the Ascension process. 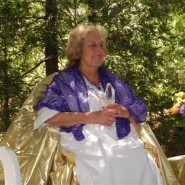 While living in Montana in 1997, she received direct guidance from Adama, and the Lemurian Council of Light of Telos to move to Mount Shasta in preparation for a mission with them that would eventually become the major aspect of her life’s work. She moved to Mount Shasta one year later in June 1998. After she had settled into her new lifestyle she began her great service as a channel for the teachings of Telos given mainly by Adama, the High Priest of Telos, but also from others in Telos as well as several Ascended Masters desiring to assist humanity during this time of extraordinary and irreversible change. She was the founder of Mount Shasta Light Publishing and the Lemurian Connection Newsletter. At the request of Lady Quan Yin, Aurelia Louise channeled through her cat Angelo a touching message from the animal kingdom, now in a book called: “Angelo’s Message to the World.” Angelo was her favorite cat who incarnated to be with her another time in order to bring forth his message on behalf of the animal kingdom, regarding the treatment of animals on this planet. She published three books about Telos and the Lemurian teachings~ The Telos Books are now published in French, English, Spanish, Hebrew, Romanian, Portuguese, German, Italian, Japanese. Chinese, Korean, Estonian, Greek, Russian and soon Slovenian. The Seven Sacred Flames – Hard cover, full color book with 16 color graphics. 280 pages – high quality and elegant book. At this time especially, these books are important tools for understanding the ascension process currently underway for our planet and for those willing to reawaken to Christ Consciousness. This is the dawning of the 7th Golden Age of Man, the Age of Aquarius which will continue indefinitely as the Divine Plan for the planet. The Telos books offer us a glimpse of our own future when we spiritually awaken and evolve our consciousness to the level of the 5th dimension which our Lemurian brothers and sisters have been quietly enjoying in their subterranean city for thousands of years. They look forward to when they can share the wisdom and advanced technology that can help us solve what currently appear to be insurmountable problems. Immortality, free energy,pollution free living, space travel and interplanetary connections are just a few of the things we have to look forward to. The books serve as maps for raising our vibrations enough so we can ride the immensely powerful ascension waves now flooding the Earth with increasing intensity. Aurelia Louse Jones made her transition on July 12, 2009 and now continues her mission from the other side of the veil as Adama told her she would. Personal communications from her come with a sense of urgency. About three months after her transition into the 5th dimension, she surprised members of Telos Worldwide in Canada by popping into their meeting. Very briefly she answered personal questions about her new life and then dove very passionately into the topic of unhealed emotions which she was shocked to realize she had grossly underestimated in her life. What she shared underscored the messages she had channeled from Telos but she had failed to realize the magnitude of the issue because so many of our emotional blockages are buried in our subconscious and unconscious mind. She urged us to have the courage and determination to move beyond our comfort zone and open the doors to what scares us, to the feelings of shame, guilt, rage, judgment, hatred, abandonment, and “any emotion that makes you lose your smile.” She also encouraged us to think of it as a journey of self-discovery without self-judgment or criticism and to know that those emotional energies we judge as negative we created to fully experience what it is to live in the duality and separation of the 3rd dimension. She used “rage” to illustrate her version of what therapists would call “Voice Dialog.” “Unconditionally accept these emotions in you, these energies, these consciousnesses. If they feel your love, if you cease to judge yourself, to criticize yourself, it’s like you could, in those moments, take some of the (emotional) ocean that is in you and change its color and vibration. In her example of rage, she said, “ask the emotion to come and talk with you because you do not know it…you can ask your Higher Self to be the prime director, overseeing the dialogue with your inner rage. You will feel things inside of you or you will relive a situation you have experienced or will see pictures or people you do not know at all. It does not matter. Keep going with the discussion, the intuition, or images that come to you and make that rage talk to you. You are the person who questions the rage and you are the character who claims to be the rage in you and you play the game. Continue this dialogue until you have resolved this feeling, until you have accepted it. You talk to the rage that manifested itself in you until at some point there is no more rage inside and you only feel peace and light within you. Then you are done with this emotion. It has been transmuted. You have welcomed it, loved it, and changed the vibration of the rage from Non-love to Love because you recognize the energy and understanding it brings you. You always end the conversation by saying that you acknowledge that rage as yours, that you recognize it as your child, as your creation, as an energy that you have created, that you have experienced, and that the experience is now ending, and that from this day forward, you only want to know joy, light, and peace. You thank the rage and you imagine it transformed into light, joy, peace, a flower, a balloon, a bird or anything you want. “You can try this little recipe with all the emotions you know…this way you will discover the population that lives in your unconsciousness. I tell you I was very surprised to discover all that activity in my unconsciousness, Very surprised indeed! Had I known 20, 10 or even 5 years ago all that was inside of me that I was ignoring, I might have known a different ending. I’m not saying this to get pity for myself. On the contrary, it is just a realization! This is an example! The above transmission from Aurelia is a reflection of the love and compassion she continues to offer us from her current perspective. She urges us to seize the opportunity for ascension but warns us to not underestimate the impact of unhealed emotions which must be resolved one way or another as a prerequisite for our victory.